PIONEER Computers Australia introduces their DreamMicro NSR 780 network attached data storage system. 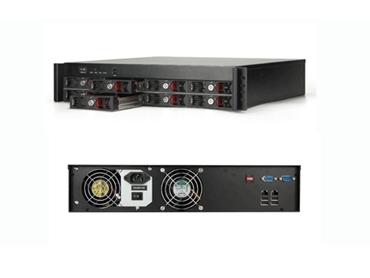 The DreamMicro NSR780 network attached data storage system has eight S-ATA II drive bays that are easily accessible through lockable front levers that allow hard drives to be securely installed in moments. Dual Gigabit LAN ensures fast data transfer speeds. The data storage system supports a type-1 compact flash slot for embedded OS installations and uses PCI-Express-based Gigabit networking to handle file transfers quickly and efficiently. A mini-PCI port is also available for additional security related add-in cards such as hardware VPN or anti-virus modules. LEDs include individual S-ATA port activity, overall hard drive activity, network activity and power. There are also custom LED control and push button backupand recovery options. The DreamMicro data storage system supports Microsoft Windows Server 2003/2007, Windows Home Server and Linux. System monitoring and management includes Wake-on-LAN, Wake-on-Alarm and Watch Dog Timer. A complete driver and SDK is available to customers.